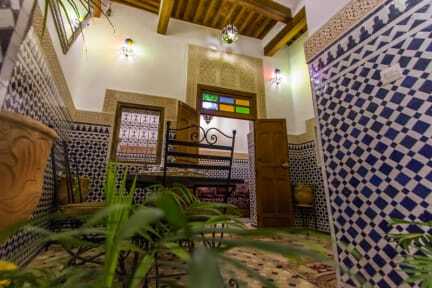 Dar Bhija has spacious rooms surrounding a tranquil courtyard to enjoy a relaxing atmosphere and to spend pleasant stay in Fes. At Dar Bhija boasts an excellent service, superior facilities, and a great team which will make your stay unforgettable. 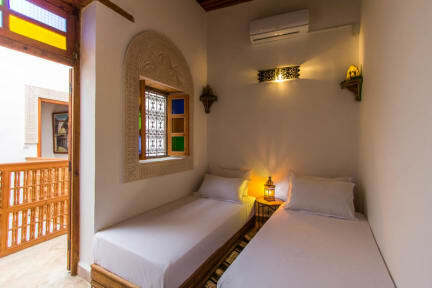 Dar Bhija is located in the Fes El Bali district in Fès, 400 metres from Henna Souq, one of the medina's oldest marketplaces and 1 Km from The Chaouwara tanneries one of the city’s most iconic sights. Dar Bhija offers easy access to the city’s must-see destinations like Tanneries, Madrasa Bouanania, Bab Boujloud, Quarawiyin University, Mausoleum Moulay Idriss, Madrasa Sefarine, Souks, etc. Dar Bhija has spacious rooms surrounding a tranquil courtyard. Each room comes with a private bathroom. Check in from 14:00 to 00.00. Check out from 8:00 to 12:00. Taxes not included - occupancy tax 2 euros per person per night.